Original drawing largely from the areas of Folk and World music. "another milestone in folk’s rebirth of cool", but those in the know will tell you that there is more to Gigspanner than meets the eye. Ultimately, the music Gigspanner produces confounds any attempt to label it, and it is that intriguing, indefinable ingredient that continues to inspire audiences of all leanings, bringing them back for more. As a trio they have successfully amalgamated the diverse sum of their parts, and have honed and polished a brand that is uniquely theirs, without any show of gimmickry. 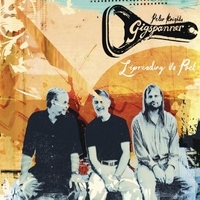 Finding the perfect vehicle to showcase the breadth of his virtuosity, Peter’s musicianship within the context of Gigspanner is a revelation to those whose only experience of his playing has been limited to Steeleye Span. Within Gigspanner, Peter’s musicianship is further enhanced by the flawless playing of Roger Flack on Guitar and Vincent Salzfaas on Congas and Djembe. Both have been described as "powerful and intelligent musicians in their own right" (Geoff Boudreau, Rye Arts Festival). As a founding member of Celtic-Rock Band ‘The Tabs’, Roger is primarily a rock musician who shares Peters’ affinity with traditional material, whilst Vincent who has studied his craft in Senegal and Cuba, adds another dimension, one that is distinctly multi-cultural. As R2 magazine noted, it is Vincent’s musical presence that seals the deal with regard to what makes ‘Gigspanner different’. What they do have in common is an unwavering, single minded commitment to dig deep and to load the music with something of value. Gigspanner’s audience knows that it is being honoured with a gift that is the difference between ‘entertaining’ and ‘spellbinding’. Gigspanner’s Debut Album ‘Lipreading the Poet’ was named by 'The Wire' as one of the best 15 Global Albums of 2009. But ditch the pigeonholes. Gigspanner's commitment to producing "music of intelligently crafted brilliance" (Songlines) has paid off in spades, and they have now earned their place on the festival and concert stages of the UK and beyond. Beautiful Instrumentals and fine treatments of traditional pieces"
that belies the pared-down instrumental line-up. Exceptional stuff, and not to be missed"
"Altogether gorgeous, music to sustain the spirit. Rarely have I heard such insistent calls for encores"